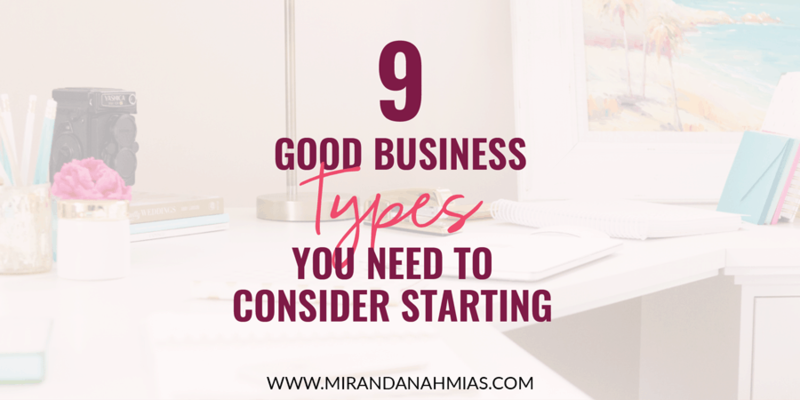 9 Good Business Types You Need to Consider Starting | Miranda Nahmias & Co. When I first started my business in 2015, I had no idea that I would be offering so many services! I actually originally thought that I wanted to be a graphic designer, but then started to do virtual assistant and marketing work, and fell in love with that instead! On my journey from confused side hustler to 6-figure agency owner, I’ve learned that it’s much easier to start with a game plan than to jump in without any idea of what kind of business you even want. Plus, business types are abundant, and you can create one that’s unique to you! If you’re just starting out with your business, then stick around. 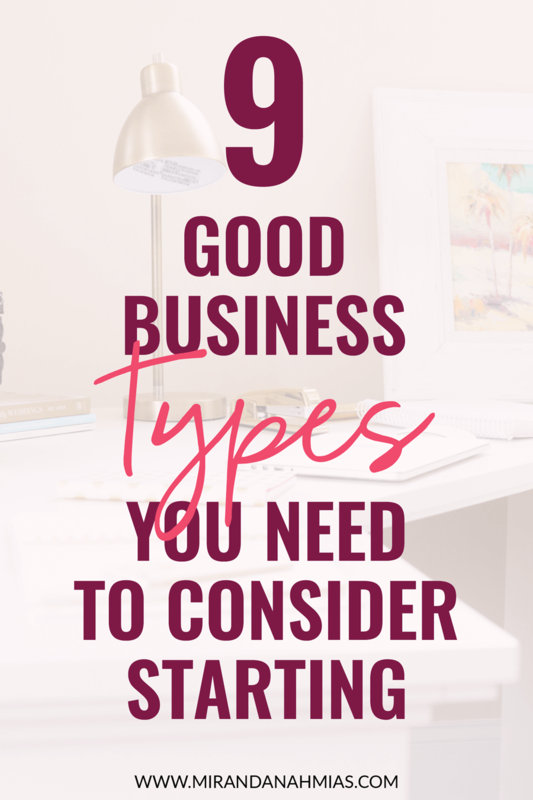 I’ve got some tips to help you figure out what the heck you’re doing and choose between all the different business types out there. If you have not yet selected a business, take your time and wait for the business that is just right for you. You will not be penalized for missing opportunities. The selection process takes a lot of planning, and experience and knowledge is vital for your success. 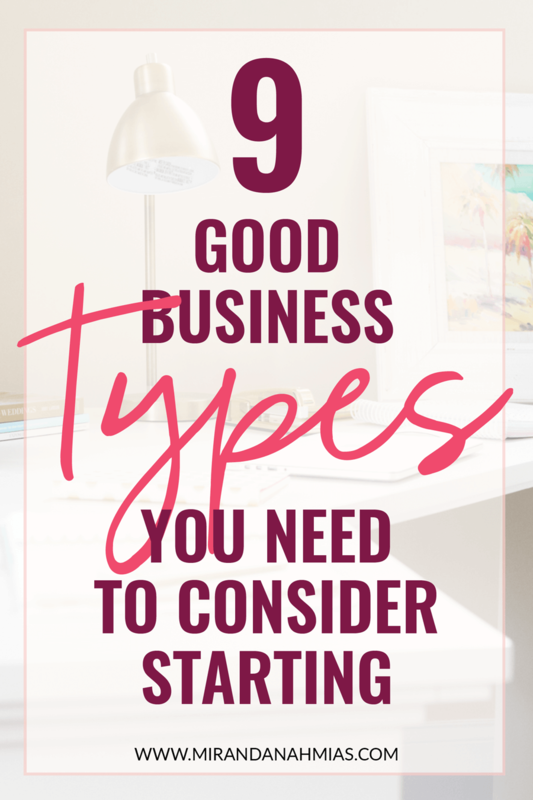 With all these different business types to choose from, you should absolutely take your time and consider each one carefully! Feeling stuck? Here are some ideas to get you started. Think about your strengths and weaknesses. How can you make them work together in a business? What about your personality type? That will help you resonate with the right people. Don’t tackle or pursue businesses that may be too challenging. It is better to identify a one-foot hurdle than try to jump a seven-footer. For example, starting an online business is easier than starting a brick and mortar one. Try to identify a business that has long-term potential. For example, basing your services off a trend is a bad idea. If a few years ago anyone launched a business as a Periscope coach or someone who taught people how to use that app, they’d be out of business now, or facing a huge pivot! Keep in mind that, as a general rule, specialists do better than non-specialists. Wouldn’t you be more inclined to take your sick cat to a veterinarian whose practice is limited to cats rather than to a general practitioner? Check your savings account and your budget. A common problem is not having much money to start a business. Surprisingly, there are a number of businesses that require no money at all. You don’t have to oodles amount of cash in order to start a business or make an investment in a new business idea. On the top of a blank sheet of paper, write an activity you like to perform. List as many businesses you can think of that are related to that activity. On the same sheets, list all the products or services you can think of that are related to that activity. Use your imagination and think of every possible product or service you could perform. Then, narrow down your choices by asking yourself questions about each potential option. Is it something I enjoy doing and could imagine doing every day for the rest of my life? Does it solve a need? Can I handle the start-up costs (if there are any)? Can I easily learn how to run this kind of business? Are there important aspects of this business that I really don’t like or am not interested in? From there, you’ll get a better understanding of what services you can provide and be a rockstar doing it! If you’re still looking for inspiration, check out this article from Neil Patel. I also have a list of services below that you can take a look at and see if any of them sounds like you. First, you need to determine what type you even want. Are there any business types that speak to you? Maybe you want to offer a service, sell a product, or produce your own radio show! If you enjoy helping others, discussing strategies, and talking to others in general, then you may be suitable for coaching. There are business coaches, sales coaches, life coaches, and even mom coaches! The sky’s the limit when it comes to coaching because, honestly, you just have to build a niche community and produce concrete results for your clients. Some people just have a knack for teaching. And there’s certainly millions of people out there who enjoy learning new things! It’s unbelievable how many ways we have to teach our expertise, too. You can speak at conference, write published books or ebooks, start a podcast, sell an infoproduct, or offer tutoring services. I have a huge list of free online courses available to take, but there are also entrepreneurs who are making millions selling online courses with lengthy modules and workbooks. Blogging is a great way to make passive income if you incorporate affiliate marketing into your content. It basically works like this: you earn a commission by including links in your blog posts that take visitors to another site where they can purchase a product. Affiliate programs will grant you a custom a link so they know to that they should give you credit when your website is bringing referrals their way. An authority site is professional blogging taken to the next level, typically with multiple posts a day and multiple staff writers or guest authors. Typically they make their money from advertising, sponsorships, and/or affiliate marketing. There are plenty of established businesses out there who are ready to outsource work to an experienced freelancers. Freelance work could be copywriting, social media management, video editing, project management, or dozens of other services. Lots of freelancers list their services on sites like Fiverr or Upwork. Some people are born leaders and want to be the head of a small team. You can specialize in one specific area and start hiring subcontractor in order to take on more clients. Or, you can offer a variety of services and hire a subcontractor to fill each specific role. For example, my team has a project manager, a few copywriters, a graphic designer, a sales funnel expert, and more! You can truly work for yourself by becoming an influencer! Instead of offering products and services, what would it be like to have brands approach you for endorsements? It’s happening much more often because of influencer marketing. It really depends on how big your audience is and how engaged they are. YouTubers are paid several thousand dollars per video for sponsorships and Instagrammers can be paid several hundred to well over 6-figures for each Instagram post. Kylie Jenner doesn’t pay for any advertising at all on her cosmetic line — she shares posts on Instagram and Snapchat which is seen by her millions of followers! Got a heart that’s ready to serve? Then maybe a nonprofit is right for you! Nonprofits can be notorious for not making much money for the employees involved, but the right people won’t care. They enjoy serving and making a difference in their community much more. If you’re interested in starting a brick-and-mortar business, then it sounds like you’re interested in local services. This includes restaurants, dry cleaners, salons, used bookstores — the list can go on and on. And it doesn’t necessarily have to include a brick-and-mortar location. There are some local services you can do right from your house, including tutoring, nannying/daycare, and lawn care. Hopefully this post inspired you to think a little differently about all the business types out there, and see that entrepreneurship is totally possible for you. There is a bountiful amount of business types out there so I’m positive that there’s one that will work for you! All you need is a passion, a positive mindset, and the will to get started!